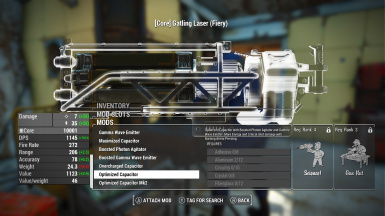 Laser and Plasma weapon mods for high level players and difficulty. 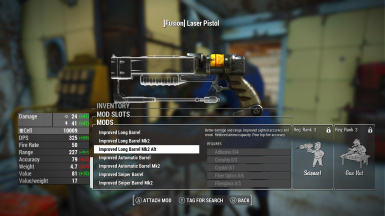 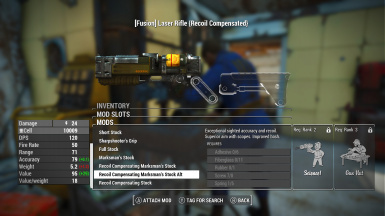 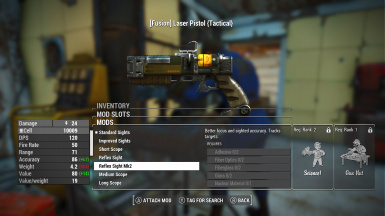 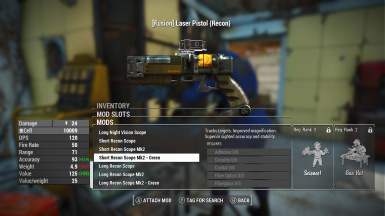 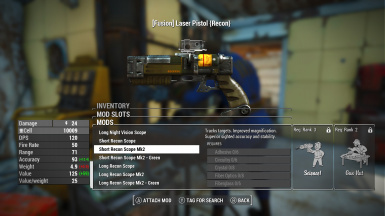 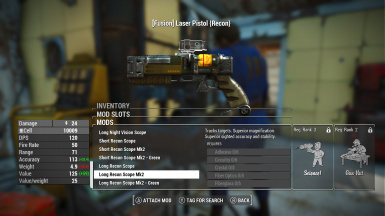 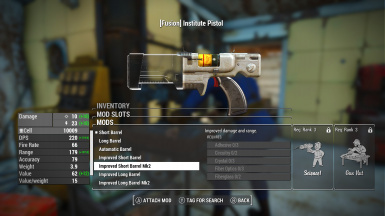 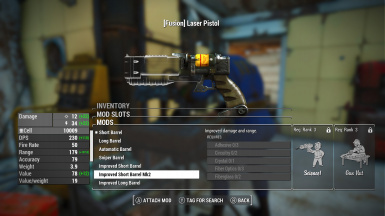 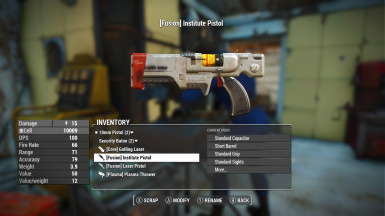 These mods increase the damage the weapon will produce. 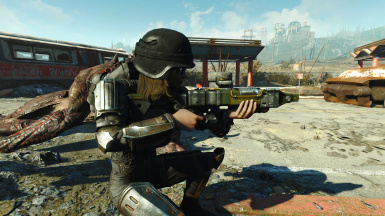 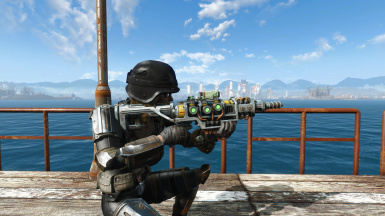 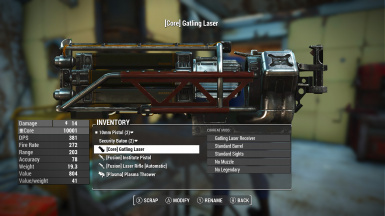 For Laser Guns, Plasma Guns, Gatling Laser Guns and Institute Laser Guns. 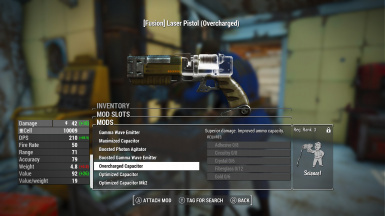 Optional version increase weapon and projectile range. 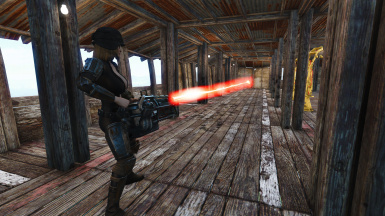 Added version with increase range on weapons and projectiles. 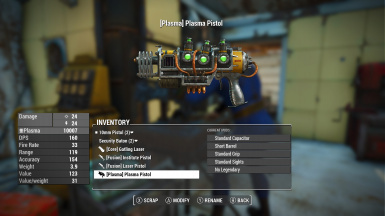 Perks Rifleman02, Rifleman03, Commando02, Commando03, HeavyGunner02 and HeavyGunner03 have weapon range increase added to them similarly to the increase added by Gunslinger02 (1.25 increase) and Gunslinger03 (1.5 increase) to their respective weapon types. 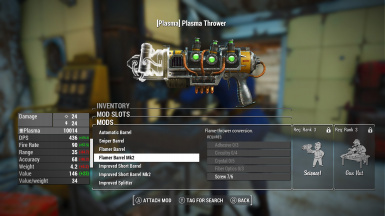 Projectiles have been increased up to 25000. Corrected ZoomDataCameraOffsetZ for Improved Automatic Barrel Mk2 Alt, 2 and 3. 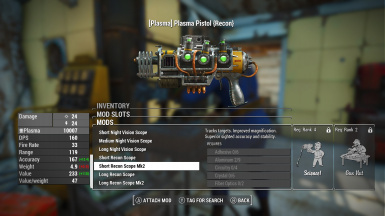 Additional six records were edited for the reduced recoil versions. 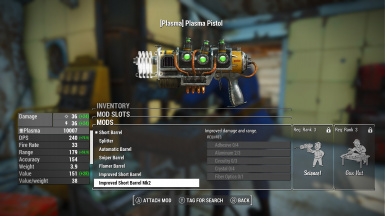 Plasma - "Splitter" and "Improved Splitter" Laser/Institute - "Beam Splitter" and "Amplified Beam Splitter"
Added Long Plasma Barrels with and without suppressors. 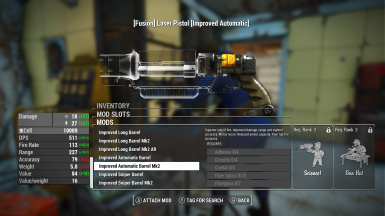 Mods created on either version will work on either version. 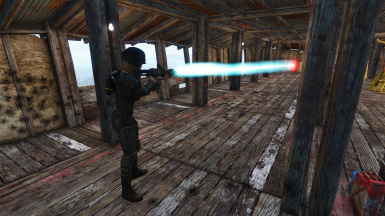 Note: Continuous Beam Lasers do not work in VATS. 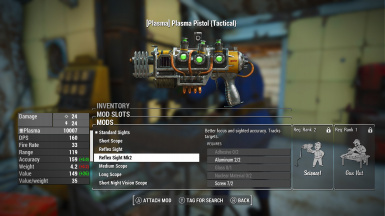 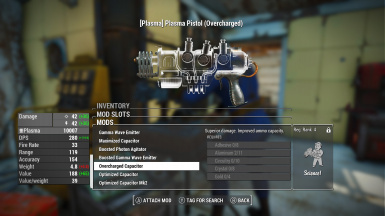 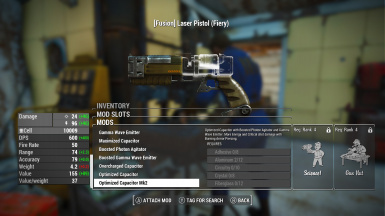 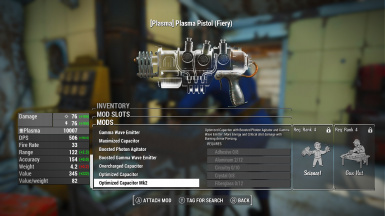 I added these higher power mods because the energy weapons felt to weak at high levels and high difficulty. 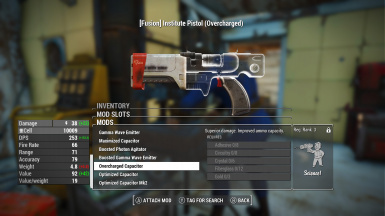 Should be compatible with most setups. 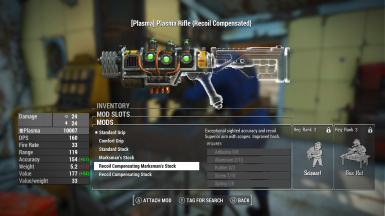 Two records have been altered for the plasma short barrel mesh. 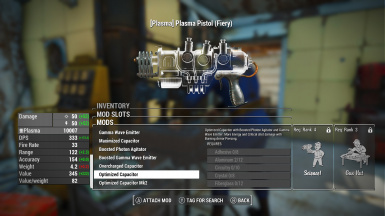 Plasma - "Short Barrel" and "Improved Short Barrel"
Additional six records were edited for the reduced recoil versions. 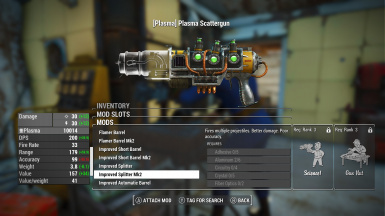 Plasma - "Splitter" and "Improved Splitter"
Laser/Institute - "Beam Splitter" and "Amplified Beam Splitter"
Optional version increase weapon and projectile range. Perks Rifleman02, Rifleman03, Commando02, Commando03, HeavyGunner02 and HeavyGunner03 have weapon range increase added to them similarly to the increase added by Gunslinger02 (1.25 increase) and Gunslinger03 (1.5 increase) to their respective weapon types. 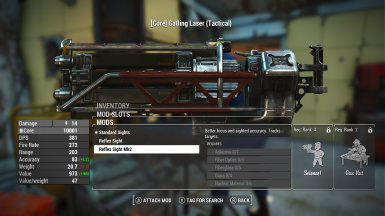 Projectiles have been increased up to 25000. 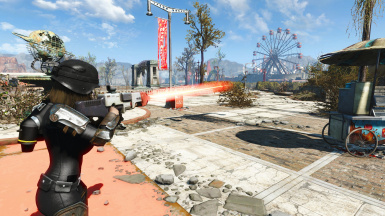 These changes will help sniper type players but also add a little more realism (projectiles won't arbitrary disappear at a relatively short distance). If you have another mod that alters these, place this mod After the others so this will take priority. 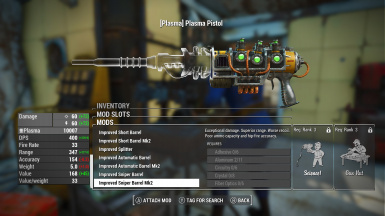 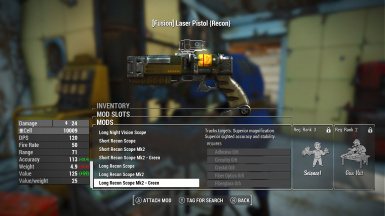 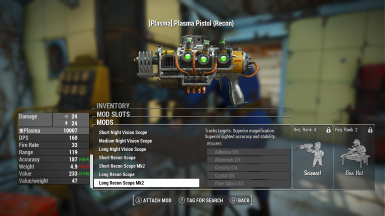 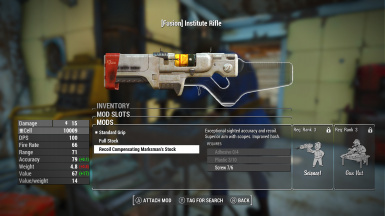 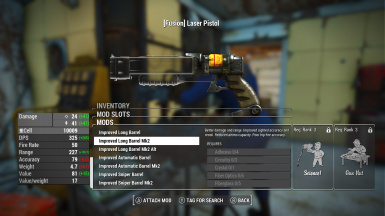 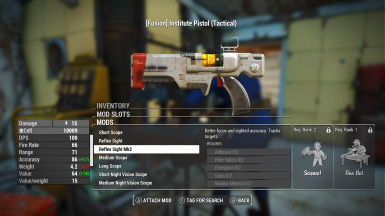 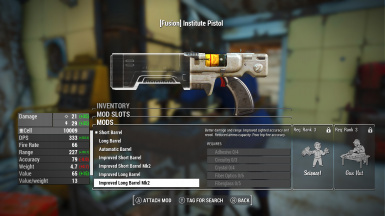 All mods require Science and Gun nut perks. 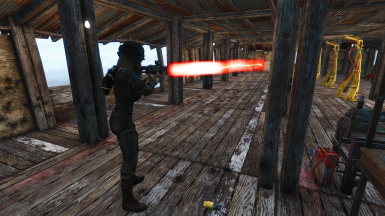 The new Laser Barrels and Receivers add physical damage. 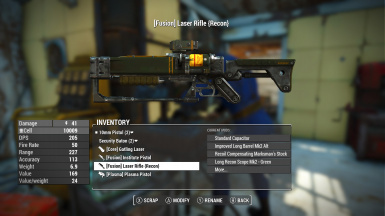 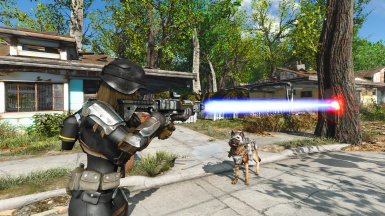 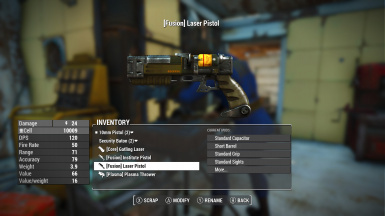 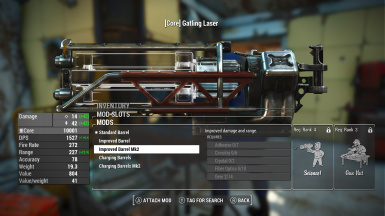 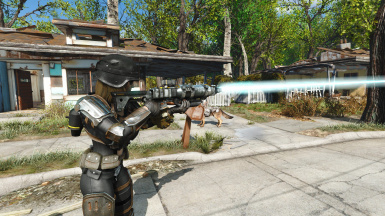 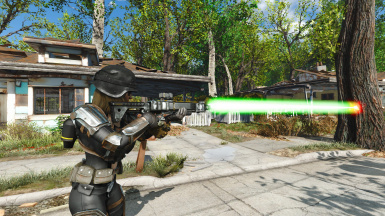 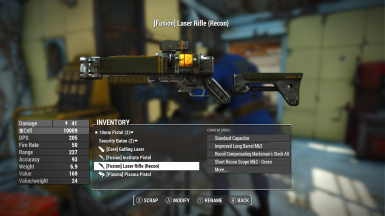 When lasers cut and burn there is physical damage, strange omission from Bethesda. The pictures shown are from a level one character with 4's in SPECIAL. 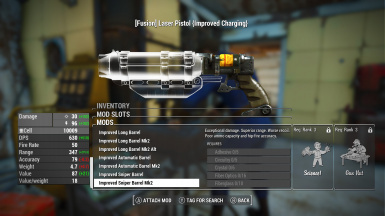 Barrels - Improved damage and range. 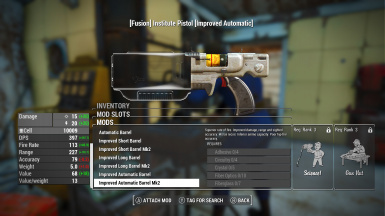 - All barrel types supported. Stocks - Better stability - Recoil Compensating Marksman's Stock. 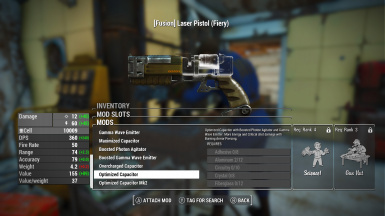 - Many types available. 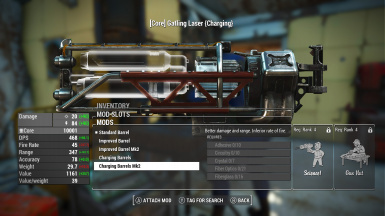 Receiver - Combines Overcharged Capacitor, Boosted Photon Agitator and Gamma Wave Emitter. - Two type for each. 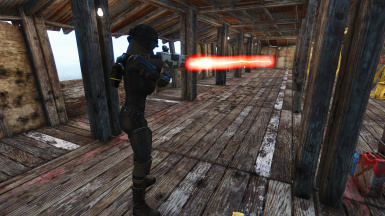 Reflex Sights - Added "Tracks targets"
Scopes - Added "Tracks targets"
Note: Continuous Beam Lasers do not work in VATS. 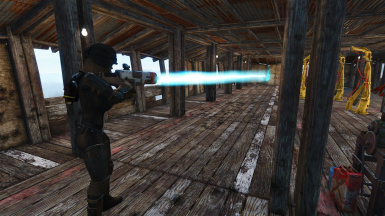 The beam does not damage target. 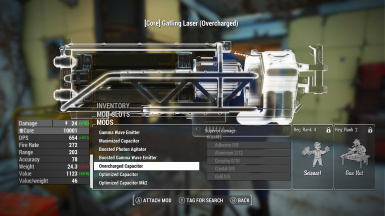 Game Engine Bug. 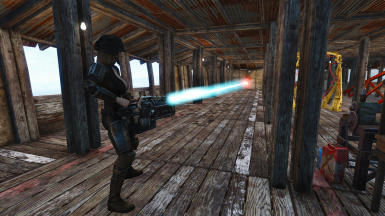 The Beam work correctly during no VATS game play. 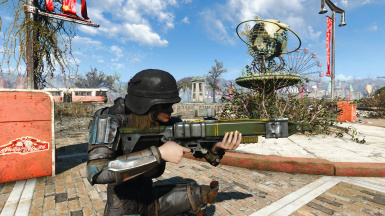 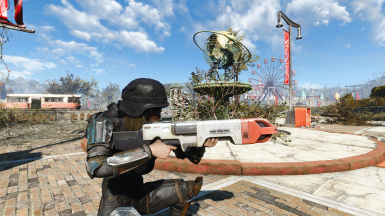 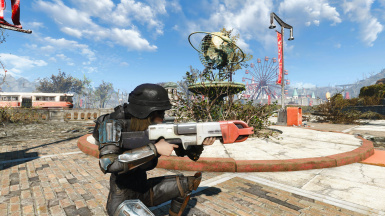 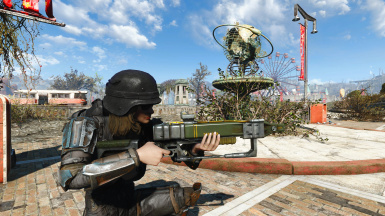 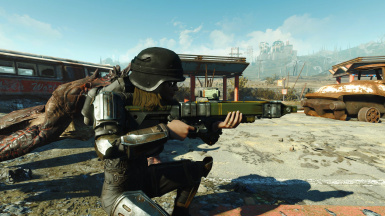 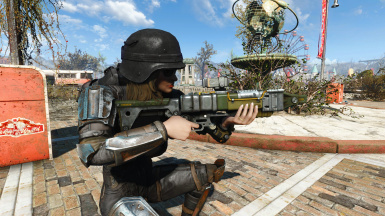 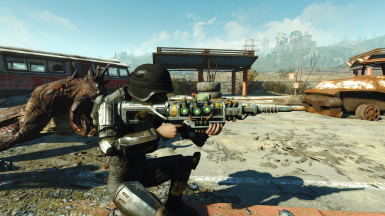 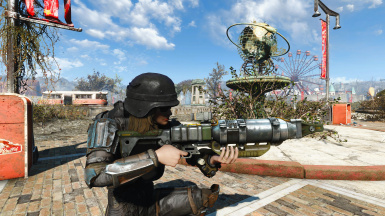 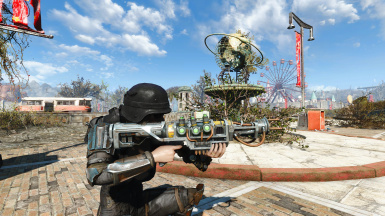 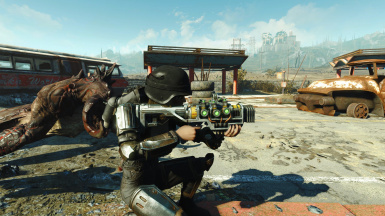 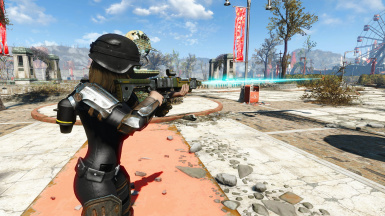 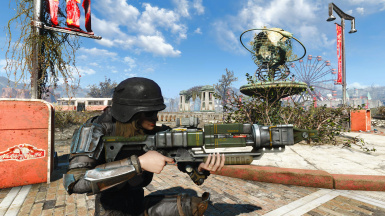 Also available on Bethesda.net Check the mirrors tab for the links.